One of the big barriers well educated trainers have to going online is figuring out how to do a proper assessment with online clients. On the face of it this is a tough problem to solve, how do you properly assess someone when you're not actually with them? As with everything needed for quality online training we help you solve this problem. First up, what should you include in an online client assessment? The answer to this is simple. Aim to replicate your face to face client assessments. Things like movement screens, flexibility tests, performance tests, endurance tests, body composition tests and more are all very doable online. Once you decide what you wish to include you should put together your assessment and include videos showing one rep of many of your tests. Then send this assessment to your client. This video shows how to set up an assessment using PT Distinction. Option 1 – Live assessment over Skype, or Zoom. The reason I recommend sending the assessment to your client before a live call is to make the assessment far less cumbersome. Your client can now view what they have to do on screen, then preform it in front of the computer while you observe their movement. With this type of live assessment you can cover all forms of assessment other than maximum strength tests which obviously require a trained spotter. You can give your clients guidance and see exactly what they're doing as they do it. You should also have your clients assessment open in the software to record results and observations directly in the live session (shown in the picture above). Option 2 – Video Assessment. 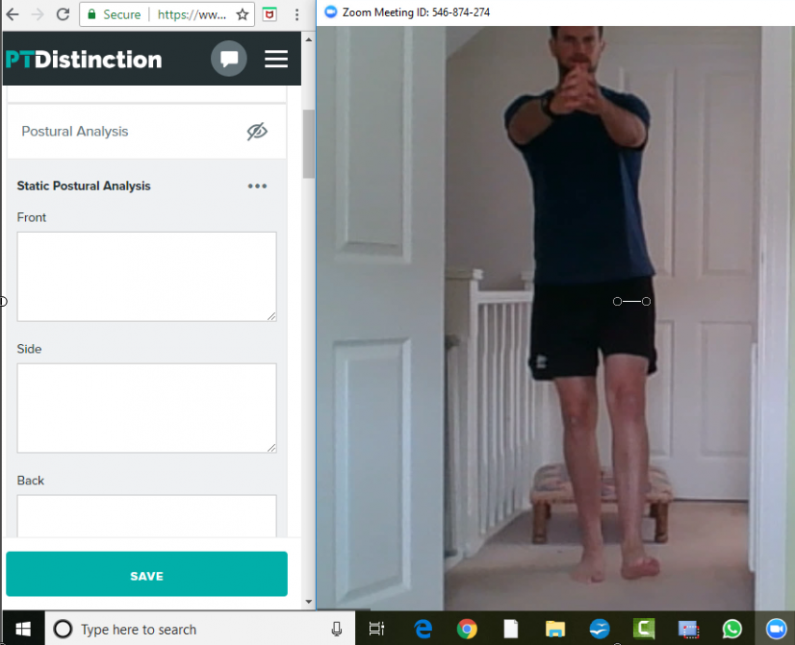 Once you send a client their assessment the PT Distinction software allows them to view the demo, then film themselves performing each test from right inside the assessment (shown in the picture above). Clients can also record any measurements and numerical results. Video assessment allows you to perform movement screens, performance tests (and check form), tape measurements (and see clients are doing it right), flexibility tests and more. While perhaps not quite as good for creating a close trainer/ client relationship and having the option to prompt while live on the call it does offer great flexibility to you and to your clients. Your clients can perform the assessment at a time that suits them and you can view the assessments at a time that suits you. Meaning no need to arrange schedules around when you're both available which is often difficult with international clients. Once your assessments are done, tailoring your online programming and coaching for each individual client becomes very easy. To grow a successful online training business join the premier software for educated trainers free for your first month.